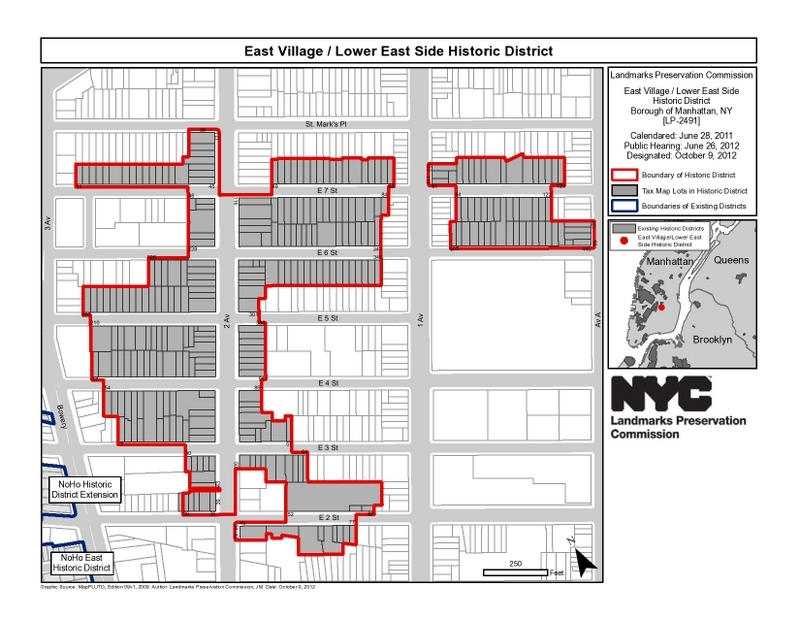 Map of East Village/Lower East Side Historic District. Credit: LPC. Support and opposition to landmarking reiterated at City Council level. On January 31, 2013, the City Council’s Land Use Committee voted to approve the Landmarks Preservation Commission’s designation of the East Village/Lower East Side Historic District in Manhattan. The district includes approximately 325 buildings, and is composed of two distinct sections on each side of First Avenue. On October 9, 2012, Landmarks approved the designation after modifying the boundaries of the proposal initially presented to the Commission. Landmarks found the area significant for its pre-Depression residential architecture and its social history as a home to successive waves of immigrant communities, as well as an epicenter of bohemian life. At Landmarks’ June 26, 2012 public hearing, the vast majority of speakers testified in support of designation, though some local religious institutions opposed, including the Catholic Worker, the St. Stanislaus Bishop and Martyr Roman Catholic Church, and St. Mary’s Orthodox Church. Council Member Dan Halloran wanted to know the ratio of support to opposition received by the Landmarks Commission. Fernandez promised to provide that information to the subcommittee. Council Members Jumaane Williams and Maria del Carmen Arroyo asked for clarification of how historic district boundaries were determined, and when areas can be excluded. Mendez defended Landmarks as having done its “due diligence” in community outreach, including community hearings and individual meetings with those who had concerns with the designation. Speakers in support of designation included representatives of community and preservation groups, as well as several neighborhood residents. A representative of State Senator Brad Hoylman called the district “a nationally recognized cultural center.” The Greenwich Village Society for Historic Preservation’s Amanda Davis said that while much of the district’s “critically important sites remain, too much of the East Village’s historic fabric has been eroded or destroyed in recent years.” Sara Romanoski, from the East Village Community Coalition, called the district’s buildings “functioning remnants of several iconic histories of immigrants, workers, housing, and many cultural, social, artistic, and labor movements.” A member of the Lower East Side Preservation Initiative claimed that “the vast majority of residents want landmarking.” Tom Birchard, neighborhood resident and owner of the Ukrainian restaurant Veselka, described the neighborhood as a “cauldron” of “budding entrepreneurs, designers, artists, and chefs.” Marcia Ikonomopoulos of the Kehila Kedosha Janina Synagogue and Museum testified that the district exemplified the “soul” of New York City. Two representatives of St. Stanislaus Bishop and Martyr Roman Catholic Church spoke, urging the Council to reverse Landmarks’ designation. One speaker read a statement from Pastor Tadeusz Lizińczyk stating that the parish had not been consulted over the designation, that Landmarks’ historical information was incorrect, and that additional costs associated with landmarking would be an unfair burden on the congregation. Krystyna Piorkowska also contested Landmarks’ historical findings and said designation would impose a burden on property owners which would then be passed on to tenants. The Real Estate Board of New York also submitted written testimony in opposition to the designation. The subcommittee voted unanimously to approve the designation. On January 31, 2013, the Land Use Committee similarly approved the designation, with Mendez again voicing her support of, and pride in, the approval. Council Member Vincent Ignizio cast the lone dissenting vote, based on the opposition of local property owners. The full Council is expected to vote on the proposal on February 6, 2013. Council: East Village/Lower East Side Historic District (Jan. 31, 2013).